Everyone eats. But not many people cook every night for themselves at home. Many people work more, than they would like. Put all the facts together and you get an impetus for the development of the restaurant industry. In the food industry in the US, 12.8 million people work. This is about 9% of the total working population. Over the past three decades, the food industry has grown rapidly. Americans spend a lot of money on eating out. For example, in 2005, an average American spent $ 1054 on meals outside the home. In 2009, there were about 945 thousand different catering establishments in America. Restaurant business is one of the most popular in USA. Therefore it is logical that every enterprise of public catering wants to somehow separate from the general mass and attract visitors to itself. Digital Signage can give each company its face. One of the tasks of Digital Signage is to set your company out of the total and show others “who you are, what you do” – Mike Zmuda, NEC Display Solution. Any restaurant has a menu that can vary both in content and in price. How do I change the menu quickly, especially when there is an influx of visitors and there is no time for it? If you have a menu displayed on large monitors, then you can quickly solve this problem. Digital Signage is a good tool for promoting a new dish or an existing assortment of dishes. On the screen of monitors they look especially attractive. Digital Signage is a good tool for promoting a new dish. Digital Signage serves not only for entertainment and attracting visitors, but is also an important element of the overall design of the institution. Digital Signage is an important element of the overall design in the restaurant. Usually they say that Digital Signage in a restaurant environment is not new: TVs built into the walls, suspended over a bar counter for displaying news, sports and other programs have been used for many years. By the way, sports bars are often proud of a large number of installed TVs. As always, the most important thing is the expectation and attraction of visitors, whether it is a restaurant, a cafe, a bar or other institution. The client needs to be attracted, creating a mood for him so that he will remember it and become a regular visitor. This is the main task of the restaurant Digital Signage – to create a favorable atmosphere in the institution. The main task of Digital Signage is to create a favorable atmosphere in the restaurants. Thomas McFeeley, EK3: “A dusty TV with football or news is unlikely to lead the visitor to come to you again“. If you come to the electronics store, you can often see a few people straggling in the pile standing with their mouths open around the high-definition TVs. Visually on a quality monitor it is very easy to arouse the appetite of a visitor when he, for example, just entered the restaurant and has not yet decided to have dinner or not at this place. For Digital Signage in public catering the main content. Broadcasting on the screens of new dishes, which the visitor does not know, encourages him to try them, in contrast to the traditional text line in the menu. Opponent’s opinion: Do you really think that what a visitor is looking for or watching video on the monitor during lunch? «Digital Signage is a very important tool for a restaurant. Only Digital Signage can induce a visitor to order a new dish or buy something from your assortment in contrast to the traditional display of TV programs on monitors», — Holly Heitkamp, Wireless Ronin. «In reality, for the visitor, the most important thing is his dinner, and not what they just wait to see various information on the monitors. But once you see some new dishes or a new kind of service, the visitor will surely remember this. And in the future he will look for it. Gradually, he will get used to the need for Digital Signage and will prefer to dine in those establishments where it is», — Bryan Lesseraux, IDS Menus. «It depends on the concept of the institution. If, for example, when visiting the QSR (quick service restaurant), the visitor always expects a bright visual media registration, in contrast to conventional or European restaurants, where all this is turned off for the client», — Kevin Moll, National Food Service Advisors. 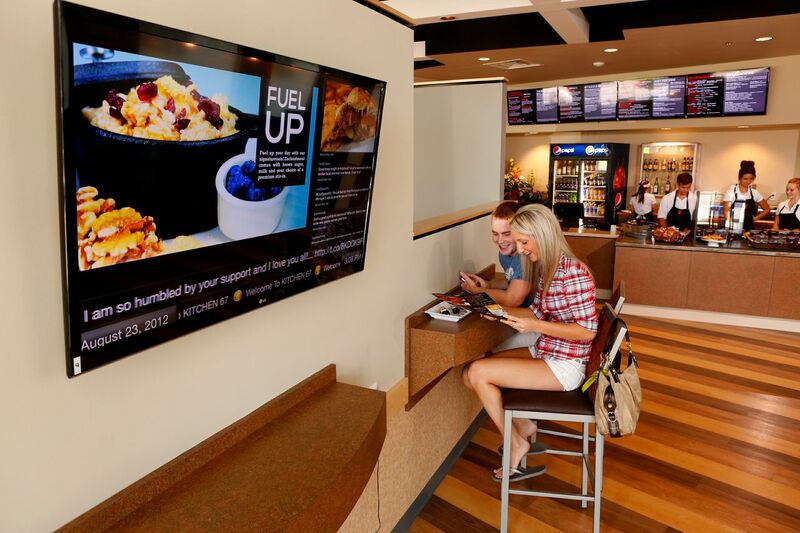 What are the main places and directions to use for Digital Signage in restaurants? «The place for placing Digital Signage is selected in order to allow visitors to easily see monitors and information on them, for example, at order racks or in places where visitors are discussing an order. Depending on the size and type of restaurants, whether fast-food or a typical restaurant, the sizes and number of monitors are chosen», — Bryan Lesseraux, IDS Menus. «Diagonal screens should always be good, do not save on this», — Kevin Moll, National Food Service Advisors. «Displays with menus should be placed at the cash desks, where they are expected to be seen by the visitor, and monitors with information about the restaurant’s offerings should be placed near the entrances», — Greg Perrill, Wand Corp.
Digital Signage in restaurants is very important. This is a modern solution that improves the life and work of everyone in the enterprise. Digital Signage is very effective for arranging a restaurant entrance area. While the visitor expects – he can on the screens of monitors study the menu, information about the restaurant and other information, thereby shortening the waiting time for maintenance. For QSR – usually the visitor chooses from ready-made sets of dishes printed on paper, for ordinary restaurants – from the menu, but sometimes some dishes are not in stock at this time. Digital Signage cleverly solves the problem of informing the visitor about the real availability of dishes, about prices, about discounts and various promo-actions. Another type of information for visitors is information on cooking technologies. Visitors should know that the food is always fresh and very well prepared. One of the old ways is to combine the kitchen and the dining room so that the diners can see the cooking process, which is not very convenient for cooks. Today, there is a new solution. Show on the screens the process of preparing dishes in a pre-edited, more “appetizing” form. Another task of the restaurant is to promote your brand, make it memorable for visitors. On screens it is necessary to show videos with cheerful smiling faces of adults and children dining in this restaurant. This is remembered and forms a strong relationship between the brand of the restaurant and the visitor. High awareness of dishes in the menu. More efficient and faster ordering of dishes. Awareness about the cooking process. Increased communication between the client and the attendants, which positively affects the impression of visiting the restaurant. If visitors already know that the restaurant uses modern technologies Digital Signage, the restaurant will benefit from knowing that the restaurant uses advanced modern technologies. The main thing for a restaurant is a reputation. Screens showing pictures with emotionally pleasant and interesting content, not only create a positive feeling in the visitor’s head, but also inspire the thought of caring for him. Digital Signage is a powerful way to increase revenue by using an interactive menu where you can not only order food, but also see these dishes in a spectacular way, which allows the restaurant to avoid zero orders. Digital Signage is a powerful tool for increasing revenue by using an interactive menu. In addition to creating a favorable atmosphere and convenience for visitors, Digital Signage can provide additional revenue from the display of commercials of third-party advertising agencies. But you do not need to get involved in the constant display of advertising – the visitor still comes to the restaurant in the hope of finding a place where he can safely eat and relax. The increase in purchasing power as a result of the improvement of the service process and the establishment of friendly relations between the client and the staff. Reducing the staff of the restaurant, which saves on training staff. Increase the overall efficiency of the enterprise, as a result of increased sales. Positive opinion of the visitor about the restaurant. “The wall menu is a very important part of any restaurant”, — Doug Watson, Regional Vice President, Mainstreet Menu Systems. For a long time, the wall menu was a “school board” where the chalk was written the name of the dishes, the prices for them, and so on. This decision seemed simple, affordable and cheap. At present, restaurants, in order to remain “afloat”, it is necessary to create a special atmosphere for the visitor. The main place for solving this problem is the shopping counter and the wall boards menu. The general impression of the restaurant depends on the quality of the digital menu board. showing dishes and other information that the visitor needs. It must be remembered that in addition to the internal wall menu, an important tool for attracting new visitors is the external menu located at the entrance to the restaurant, or in the windows of the restaurant. This allows you to attract up to 50% of potential visitors passing by or passing by. Wall-mounted menus made on LCD screens give the possibility to implement the restriction of the broadcast of content (dayparting). That is, they allow you to show the menu for breakfast in the morning, at midday – dishes for lunch, in the evening – for dinner and so on.